Our product range includes a wide range of bottle transfer chain conveyors. Our clients can avail from us, Bottle Transfer Chain Conveyors (GMP MODEL -SMS 20) that is manufactured using high grade metals as raw material. These precision engineered conveyors help in transferring bottles of different diameters from one place to another. 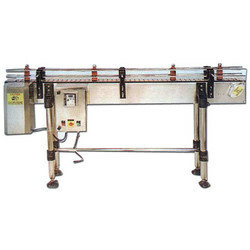 Fitted with high speed motor, these conveyors rapidly start the strapping process. Due to a process of continuous product improvement,design & specification may be modified or upgraded without notice.